I've been casually playing SC2 for around 7 weeks and I dare say that I've become quite addicted to it's PvP. 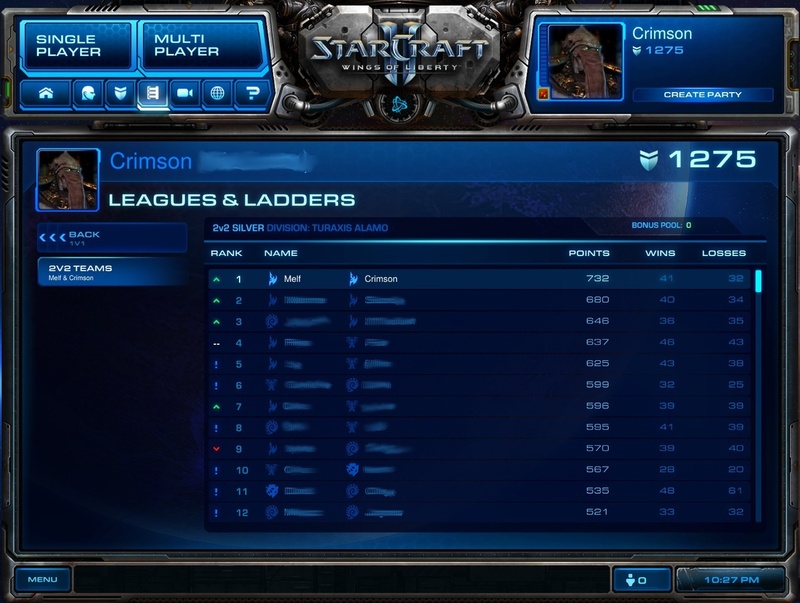 I've mainly been playing Protoss, but I've also given the other races a fair go. I'm still only in Bronze League with 1v1 and 3v3, but I'm happy to say that Melf and I managed to get to Silver League with 2v2. We also made it to the top of our division. The matching system in SC2 is very impressive. It's rare that we will go for more than 3 wins without being matched up against a superior opponent. Some of the games are so close that it literally comes down to the probes/SCVs/drones. StarCraft 2 is all about the rush tactics. Most of the games I win, are because I've rushed an opponent at the start crippling them in some way so that I can destroy them on the next wave (if not the initial rush). I've learnt to use quite a few different rush tactics, but my favourite is still the cannon rush. It's not really that hard to beat, but if you execute it correctly it can be an instant match winner. I like to consider executing a perfect cannon rush as a form of art. In the first 4 minutes of the game, you have to sneak a probe into their base and then warp in a Pylon unnoticed. Then you get one Photon Cannon operational and slowly creep into range of their base. At such an early stage in the game, there are no units that can destroy the cannons before they destroy their main building. Once the main building is down, they can no longer collect resources and it's GG. Melf and have been employing a dual cannon rush for our 2v2 games with high success. The only downside, is that if your foe beats your cannon rush, it can take a while to build up a second offense. It's pretty much GG if you can't get a base going before they rush you with their first wave of units. Still fun though. The key to winning in SC2 is being able to adapt to your opponents tactics. If you're good enough you can greatly influence their tactics and thus counter them. 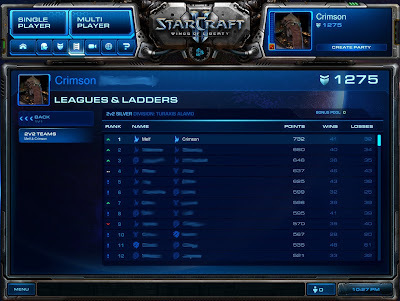 For example: A game I played recently was against someone playing Terran. Right from the start I devoted all my resources to building Void Rays (an air unit). They absolutely decimated his tanks and Marauders, which prevented him from getting the upper hand in the match. I knew that he/she would build Vikings (mostly air-to-air) to combat my Void Rays, so I stopped building them and began pumping out Stalkers (ranged unit). I won because his Vikings couldn't easily attack my Stalkers. The point here is that by building certain units, I was able to anticipate what units my opponent would build to counter and thus counter that. Confused? It's the fast decision making and micro management skills that makes SC2 so challenging and thus rewarding. The other cool thing is that the game replay system allows you to view your previous games and thus learn from your mistakes. It's like a virtual level up. In fact the replay system is so awesome, that Melf and I have been emailing each other replays of our 1v1 games and analyzing them later. I find it really interesting to watch how people think. In summary, I'd like to say that SC2 is the TF2 of RTS. If you are serious about PvP and haven't tried SC2 yet, then what are you waiting for? You don't need to be scared about getting into the PvP, since the matching system will always make sure you only play against opponents of relatively equal skill. In my opinion, SC2 is a bottle of adrenaline waiting to be opened. You should learn the 4gate attack, its pretty strong in veery match and isn't too hrd to execute. Have you been playing custom games at all? Can't say I know the 4 gate rush. Sounds hax though. Does it have something to do with warping to a hidden Pylon? I've played a few custom games, but it's mostly been League stuff. Do you have a custom map to recommend? I just hang around the top custom games, some are good, most are pretty bad. I'm not sure whether you will have the same ones, because I'm on the oceanic server. 4 gate attack is getting up 4 gateways + cyber core researching warp gates. I still prefer the pylon cannon rush though. It's more effective if done right. Oceanic servers? Did I miss something in the options? I just assumed I was on the Oceanic servers. Will check when I get home. What's your League standing? I'm sitting around 70 PLat, but I haven't played 1v1s in ages. 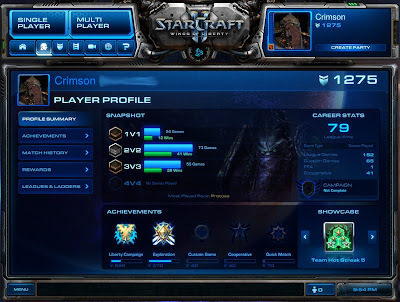 I now play SC2 with friends, and not really worry too much about increasing my ranking. Cannon rush is not really a rush in my opinion although people call it a rush build. But in reality it's a cheese build just like the 6pool. and some other lame ones. I'm not against cheese and they can win you a lot of games in lower leagues but not in the higher up leagues.